Filmed in the autumn of 2013, this short film documents the lives of three couples living with dementia and the role that an Alzheimer’s Society Singing for the Brain® group has played in their lives. The project was undertaken in partnership with Alzheimer’s Society Pembrokeshire. 00.00 Bernard and Vanessa reflect on a life of travelling and living abroad before retiring in Pembrokeshire when Bernard’s Alzheimers symptoms became clear. Now that they can no longer enjoy the long walks they used to, and Bernard is struggling to walk independently, Vanessa explains how important it has become to keep him otherwise occupied. Vanessa recalls how she noticed Alzheimers symptoms developing, including struggles with walking. They praise their local GP in initiating his diagnosis, and arranging a series of tests with specialists, and describe the occupational therapy that Bernard receives at the Memory Clinic in Haverfordwest. 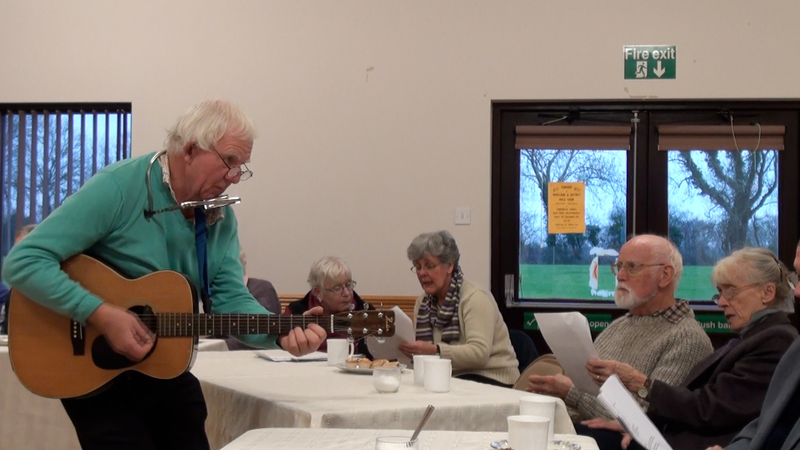 They outline the importance of the Singing for the Brain sessions, which they attend twice monthly in Crundale and Saundersfoot, as something to look forward to for both Bernard and Vanessa as a carer. 9.08 Harry and Marie from Pembroke explain how they met and discuss people’s difficulty in understanding neurological illness in contrast to more physical illness. They talk about the tell tale signs of Alzheimer’s, including Marie’s forgetting recent conversations and experiences, and the value of ‘getting out and about’. They explain the value of Singing for the Brain as a social activity which creates a sense of community and mutual support for each other. 17.20 Clive reflects on growing up in Aberystwyth and starting his career as a journalist. In 2009 Clive was diagnosed with Alzheimer’s after visiting the GP about panic attacks and mentioning struggling with his memory. Whilst the health services were slow to diagnose Clive, Rosalie explains the denial that they felt before Clive was eventually tested, and the relief that they felt at the final diagnosis and support they received from the local health service. They describe how much they look forward to Singing for the Brain and how it helps them both to relax. Rosalie and Clive discuss how friends and family struggle to deal with Clive’s Alzheimer’s, and how they have behaved with him since his diagnosis. Singing for the Brain® is designed to be a fun, stimulating and social activity for people in the early to moderate stages of dementia and their carers. Sessions are led by a trained Singing for the Brain® leader. The sessions provide an opportunity for people with dementia and carers to meet regularly in a relaxing and fun environment and involve a wide variety of music and include familiar favourites as well as simple songs that may enable harmonies or rounds. Participants are able to join in as fully as they wish and lyrics and percussion instruments are made available.